Complete replacement iPhone 3GS white rear case for the iPhone including the silver Apple logo and is labeled as 32GB. This is a complete iPhone 3GS white rear case part. 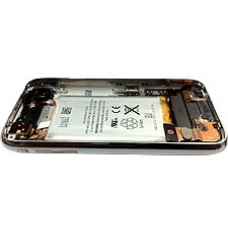 If you have damaged your white iPhone rear case, in any way, or just feel like a new one, this is the ideal quick replacement part for you, just fit your 3GS logic board and screen to have a complete iPhone with a brand new rear case! * Camera Lens Cover and Camera Holder. * Chrome Headphone Jack Ring. * Volume Key, Mute Button, Power Button. * Headphone Jack Complete Circuit. * Dock Charge Port Connector Assembly. * Loud Speaker and Microphone.